My favourite quote from Robert A. Heinlein:"Anyone who considers protocol unimportant has never dealt with a cat." She is a beautiful lady, Jams, but she isn't apt to change any more than is necessary. 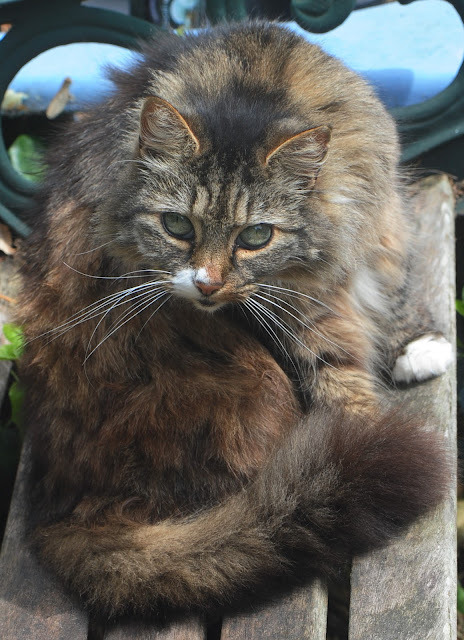 I took in Ringo as a kitten, but even going up in the house with other cats to guide her hasn't removed the feral. Unless it is really cold outside, that's where she prefers to be. Bebe became an adult as a feral, so the pull must be stronger. She is a strange one. She is very affectionate and loves to be cuddled and then she sees the axe murderer.To be honest we never expected her to become as domesticated as she did. All cats are feral creature deep (or not so deep) inside. Ah she can do tht in spades Cherie!